This post is by guest writer Elakiya Sivakumar. 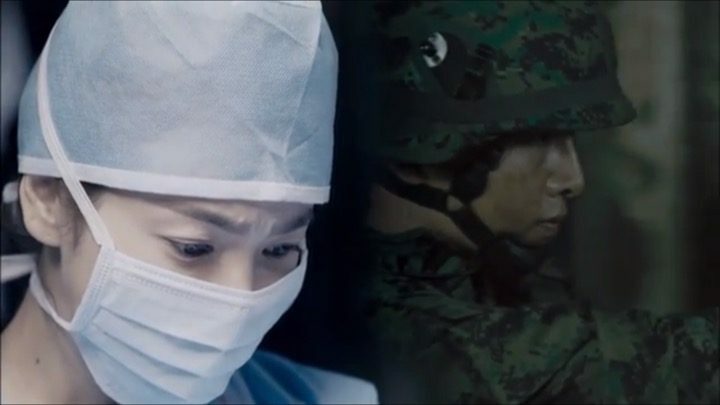 Descendants of the Sun is a groundbreaking drama revolving around the life of a female doctor and a military man. They discover true love in each other yet are separated by their profession. They’re united by their hearts but divided by their minds. The heroine’s doubts and concerns cloud their relationship and eventually end it. They meet again in a war struck area of fictitious Uruk, only to fall in love all over again. Meanwhile, conspiracy and terrorism combine forces to unleash the greatest evil. It’s an all-around treat for your eyes, ears, and heart. Descendants of the Sun literally has everything you’d wish for in a Korean drama — nail-biting plot line, seamless screenplay, first-class actors, flawless execution, stupendous cinematography, breathtaking filming sites, ruthless action, heart-wrenching tragedy, and sweet romance. This drama grasped my attention from the beginning and never let go of it to the very end. In fact, watching it just once left me unsatisfied. Each and every scene of the drama was sculpted beautifully. Every sequence of events contributed to the development of both the story and traits of the characters. Moreover, it achieved a wonderful balance of all the complex elements it offered while giving each character its time to shine. This drama is an all-around treat for your eyes, ears, and heart. These episodes use the most uncanny way of introducing the leads and the supporting characters, showing them in their natural environment. 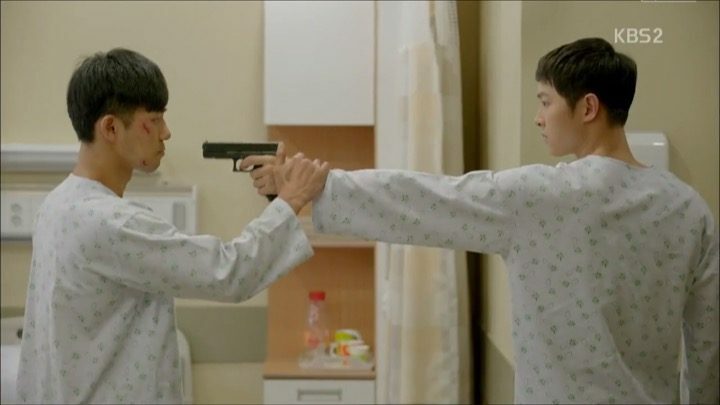 Our hero Yoon Si Jin (Song Joong Ki), is a soldier in a battlefield and our heroine Kang Mo Yeon (Song Hye Kyo), is an ER doctor. 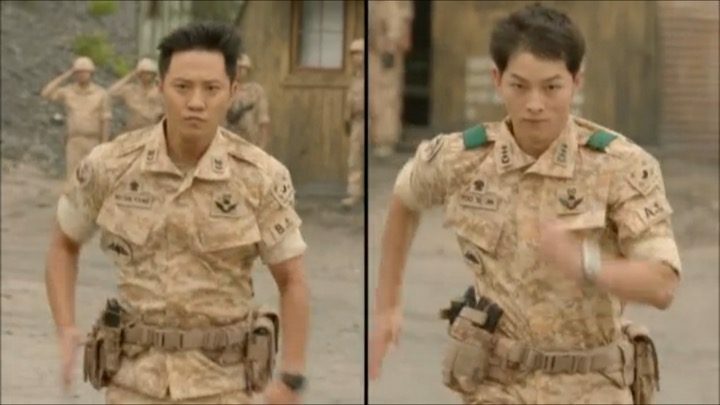 We also come to know that Si Jin’s fellow special team member, Sergeant Seo Dae Young (Jin Goo), is his unofficial best friend and partner in everything. Be it a rescue mission or stopping a petty thief, the two of them make a perfect team. And the last main character to be introduced is an army doctor named Yoon Myeong Joo (Kim Ji Won), who seems to be in hot waters with Mo Yeon and Dae Young. 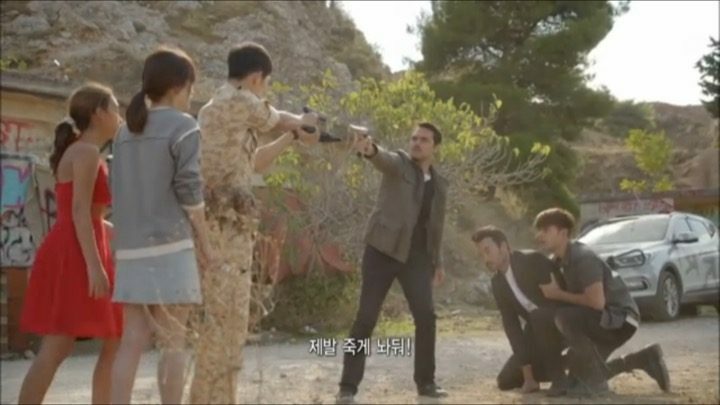 This drama is incredibly fast paced and the story develops in startling proportions. Descendants of the Sun wastes no time in establishing the romantic pairs — Si Jin and Mo Yeon, Dae Young and Myeong Joo. Si Jin and Mo Yeon’s relationship picks up fairly quickly and it’s easy to see that they’re destined to be with each other. But we also get the feeling that their relationship isn’t going to be an easy one, especially when Si Jin has to leave abruptly during their dates. And so, their relationship ultimately fizzles out as Mo Yeon becomes unsure about Si Jin’s profession. As such, our story travels from South Korea to the foreign land of Uruk, where our estranged protagonists are reunited to embark on their romantic journey once again. The entire sequence is seamlessly executed, and felt like a breath of fresh air without the usual troupe of a complicated love triangle. It’s also revealed that Myeong Joo and Dae Young’s relationship is prohibited, but they still have strong feelings for each other. While Dae Young masks it with an expressionless face, Myeong Joo hurts visibly. This forbidden romance between the two definitely got me even more excited about the future direction of the drama. Character setup are as efficient as the story setup and done equally tastefully. 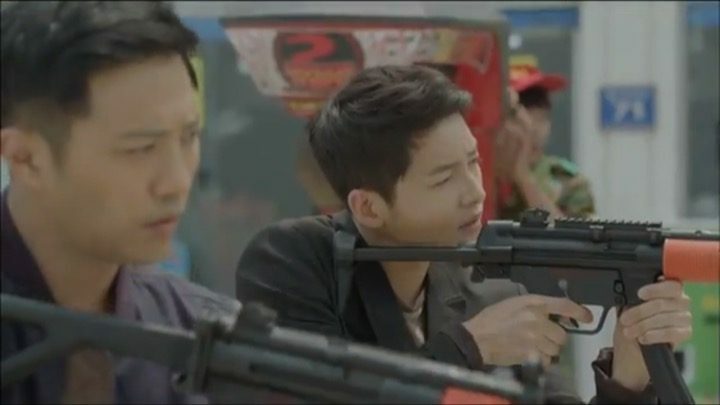 The very first scene of Descendants of the Sun immediately brings out the hero’s deftness, bravery, sense of responsibility, patriotism, and sheer skill. Subsequent scenes round him out to be a humorous, laid-back, charming, and rational person in a series of comedic events. Meanwhile, Dae Young is established as a compassionate but serious and rigid individual, who seems to have had a dark past. Mo Yeon is portrayed as a funny and light-hearted yet ambitions career woman eyeing for a big position. She seems vulnerable from having been hurt by many unjust turn of events in her life. But a set of astounding events position her as a self-centric, materialistic, and vain person, which came as a startling revelation to both the hero and the audience when we see her eight moths later. There’s one scene that particularly stood out to me and really helped me understand the deeper meaning of the drama. In this scene, we see both main characters in their habitual surroundings, doing what they do best. But the events around them interweave, creating a beautiful symphony of the fights they put up to save or protect lives. If I wasn’t enchanted by this drama at the time, this scene bewitched me completely. Overall, illogical sequences or dry spots are a rarity in these episodes. But there were a few moments where I couldn’t relate to or understand Mo Yeon’s reaction to certain issues. Though I wouldn’t exactly call it a flaw as it’s minuscule in the grand scheme of things. The drama most certainly left me wanting for more. These episodes continue the light-hearted comedic narration and character building while hinting at a greater conspiracy and villainous plans to ensue. 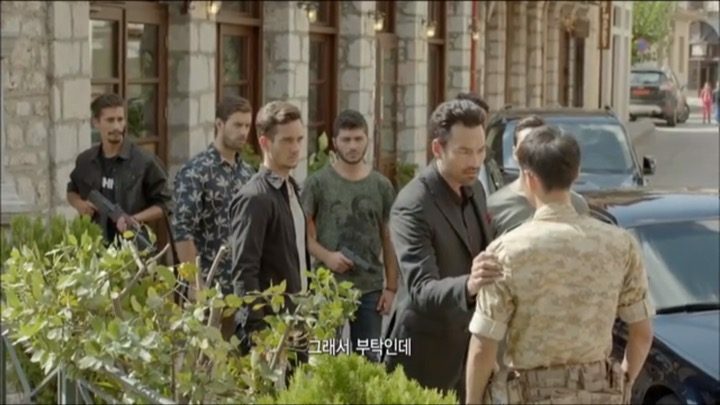 But before any of that, Descendants of the Sun takes an unexpected turn towards the end of episode six and unleashes a large scale natural disaster, leaving the protagonists and their respective teams to wrangle with the aftermath. 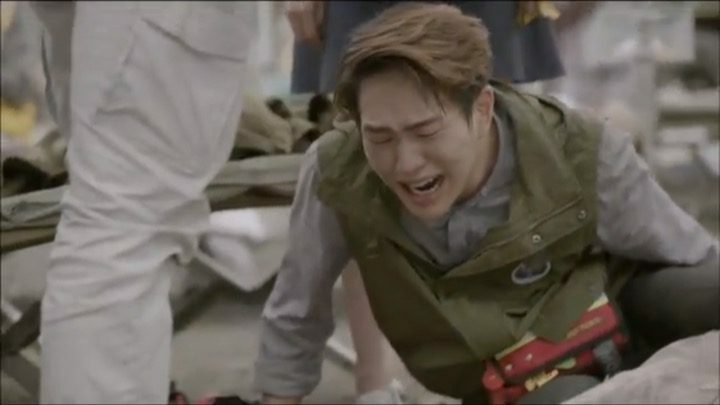 Descendants of the Sun takes its time to paint a vivid picture of blood, gore, destruction, and desolation before our eyes. Several new characters, friends and foes, are introduced in these episodes. They fit tightly into the story where no one seems out of place or unnecessary. The villain, former Delta team Captain and Si Jin’s comrade, is given central focus here. He seems to have switched sides and become a gang boss for money, leaving Si Jin to doubt if it was worth saving his life a few years ago. On the friendly side, we have a new Canadian-Korean character. He’s trained to be a doctor but fixes just about anything. He seems to be rather close to Si Jin and does extensive volunteering work. The drama paints a vivid picture of blood, gore, destruction, and desolation before our eyes. Meanwhile, existing characters are given more depth as well. Dr. Lee Chi Hoon (Onew), Mo Yeon’s colleague and junior, was previously established as a happy-go-lucky and clumsy person. But these episodes painted a picture of a spoilt brat who is kind but extremely naive. 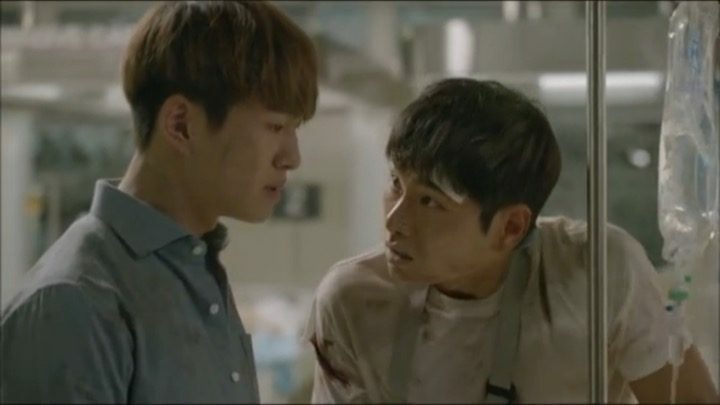 The whole sequence where Chi Hoon tries to save a dying patient was heart-wrenching to watch. We also see a little more dimension to Dae Young. He’s not only a brave soldier but also a ruthless instructor who likes to drive his trainees to sheer exhaustion. He also promises them that they can beat him up outside of the institute, which leads to a hilarious set of events. Despite all this, Dae Young is consistently shown as a person who is loyal and loves deeply. Be it Myeong Joo or Si Jin, it’s not hard to tell that he really holds them close to his heart. Mo Yeon seems to rediscover her old self as she deals with Si Jin, sick children, and the disaster. She is conveyed as a fearless yet compassionate doctor, leading her team through the situation with freakish calmness and skill. But she plays hard to get again while Si Jin begins to give up on her. This is interlaced with the strained relationship of Dae Young and Myeong Joo. The torment of romance is really felt in these episodes. All in all, these episodes maintained a very good balance between multiple sub-plotlines. The only flaw is when the Medical Team wasted time during emergency protocol to console Chi Hoon. It seemed highly illogical that three doctors and two nurses would do nothing but watch a young resident being initiated into the job in a highly dramatic way. 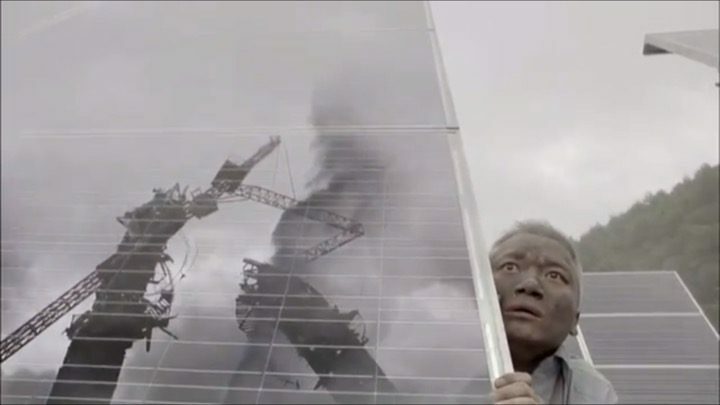 These episodes scrutinize the impact of the natural disaster in great detail. There was a tsunami of bittersweet sequences centered around the doctors as they make tough decisions about who to save. The whole execution was so detailed and realistic, with scenes that made me shut my eyes because they were hard to watch. Though largely precise, a definite miss is that the emergency protocols continue to be way off. There was a tsunami of bittersweet sequences. The leading lady becomes the focal point once again with her leadership qualities, empathy, and adorable sides. I love the way the drama brought the old, more humanistic Mo Yeon back. Chi Hoon on the other hand, changes for the worse and is painted as a coward who feels guilty and pitiful after his actions. The whole sequence involving this former joyful character brought tears to my eyes. But even while showing me gory visuals of blood and death, Descendants of the Sun was able to put a smile on my face with clever and well-placed jokes. Towards the end of this section, the drama regains its previous levels of humor and leaves a massive cliffhanger with regards to Mo Yeon and Si Jin’s relationship. But besides this, the romantic front doesn’t see much development. In fact, these episodes opted to focus more on the friendship the characters share with one another over the love lines, which was refreshing to see. For example, Mo Yeon and Myeong Joo seem to come to a consensus about their past and renewed their strained friendship. 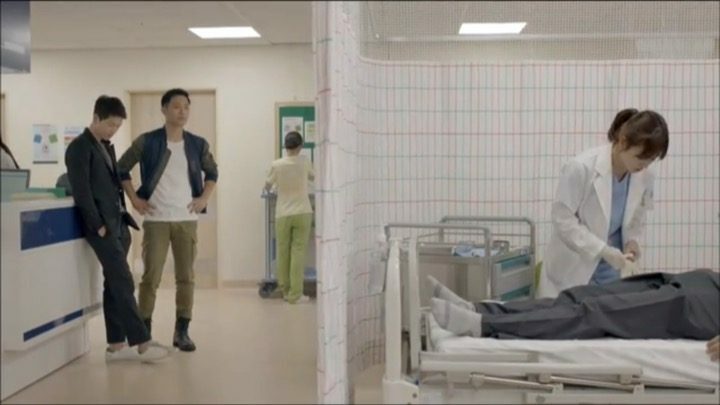 And Si Jin and Dae Young continue their bromance even while being stuck in the most dire situations. These episodes of Descendants of the Sun boast a perfect balance of romance, comedy, and thrilling action. They start out lighthearted, but quickly gets mingled with tragic, villainous, and white-knuckle elements. Captain Argus and his evil ways have finally got the best of our hero, leaving me to wonder what’s in store for us in the final four episodes of the drama. Romance regains the central focus in these episodes. Si Jin and Mo Yeon acknowledge their feelings for each other. Though their romance was put in peril at times, Mo Yeon took everyone by surprise with her unwavering love, and demonstrated to us that she’s grown and matured as a character. Meanwhile, Dae Young and Myeong Joo finally receive blessing from the obstructor of their relationship. Needless to say, there were a lot of lovey-dovey moments and feasts for the eyes. But Dae Young’s devotion is put to testament when he’s on the verge of losing his angel to an epidemic. Once again, the drama was able to entwines all of these ups and downs into one smooth and beautiful narrative. All in all, these episodes were quite engaging with insane amounts of plot twists that are all interconnected. But the Descendants of the Sun is a master at seamless storytelling and traverses between these twists and turns with ease. I never noticed any jarring transitions amidst the crazy happenings, which earns the drama high marks in my books. At the end of this section, our main characters return to Seoul to assimilate back into normal life and I can’t wait to see how they’re going to adjust given everything that they’ve been through thus far. The final chapter of Descendants of the Sun entails a string of unpredictable events to make the homestretch exceedingly interesting. Our main characters celebrate their return to the motherland with 72 hours of drinking and double dates that make us laugh nonstop. 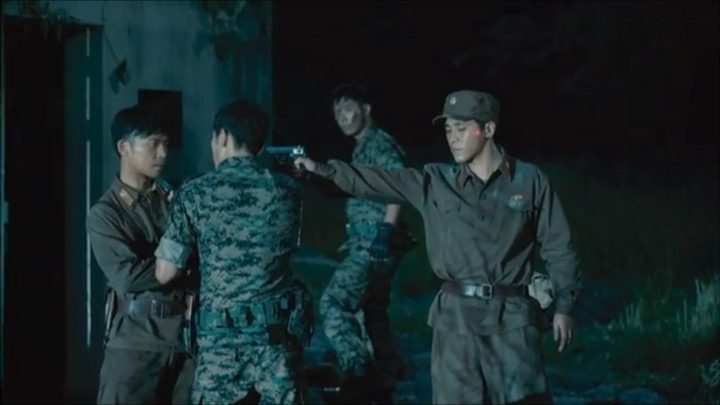 Little do they know that a North Korean soldier whom our hero fought in the very beginning makes a startling and pitiful comeback, turning episode fourteen into the best spine-chiller in the whole drama. Episode fifteen follows with lost love and tragedy, which left me brawling in front of the screen until the final episode cleared it all up and put me back into sanity. The scenes of Mo Yeon and Myoeng Joo finding companionship and comfort in each other were particularly memorable here. Seeing both of them cry together for their losses pulled the strings in my heart and brought tears to my eyes. These episodes were a complete package of everything you’d want to see in a nutshell. Descendants of the Sun make an unforgettable mark by bringing out the best in our characters and giving concrete closure to the love lines while still reflecting the uncertainties in life. All the relationships, romantic or platonic, are given well-rounded endings. Descendants of the Sun isn’t a drama that you can watch only once. It’s a perfect entertainer for a wide range of audiences, despite the fact that its plot line is quite intangible for most people. Almost none of the characters are people I can personally relate to, yet this drama managed to humanize them and make me fall in love with each and every one of them. It also focused on little details without losing sight of the larger story. While there were minor logical issues here and there, nearly everything piece worked together to create a picture-perfect epic. Descendants of the Sun is surely one nerve-wrecking rollercoaster ride not to be missed. Really can’t get enough of DoTS. Even after watching the episodes for many times already, I still find myself watching repeatedly the parts that I love most. Got hooked by the story and the excellent portrayal of the casts.